It is hard to believe, but we once again find ourselves in that very special time of year here in Chicago. It’s August, temperatures push well past the 90 degree mark, Labor Day looms just around the corner, and Midwesterners from a 150 mile radius (or more in some cases) descend on the city in unforgiving, unbreathable, highly form-fitting, man-made fabrics. Yes dear Black Gate readers – its once again time for Chicago’s Wizard World Comic Con. 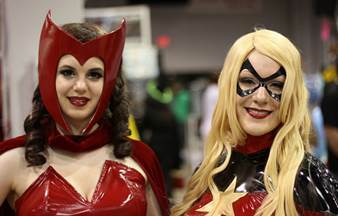 Though Wizard World never officially discloses attendance numbers, local media reports that the 2014 event has drawn nearly 100,000 visitors to the Rosemont Convention Center during its four day run. And like we have done for the last six years, Black Gate photog Chris Z and I are wading into the fray that has literally backed up traffic almost to O’Hare airport. With weathermen ominously reporting daytime temperatures would “feel like” 115 or more, Chris shows up dressed for battle in his Black Gate polo shirt and a kilt, commenting about how on this day above all others, a breeze is necessary. This isn’t the first time Chris’s Utilikilt has made an appearance and it won’t be the last. At least I am happy to report most Hollywood starlets could take a lesson from Chris on entering and exiting a low-riding vehicle without acquainting the free world with what lies beneath – if you get my meaning. Not only is this year’s Comic Con the biggest to date attendance-wise, but it is also so chock full of interesting people and projects we’re dying to tell you about that we’ll be breaking our 2014 coverage into two installments. So let’s wade in, shall we? Artist Erin Nicolson and writer Tim Compton have created a film noir setting for their new comic series Monster City, complete with a classic cast that includes Frankenstein, Phantom of the Opera, and Wolfman, among others. When a politician’s daughter is abducted by a mysterious cult, the FBI enlists the help of a psychologist and a defected member to track her down and bring her home. The two unlikely partners clash as they uncover a warring network of mobs rapidly falling under the power of Dracula and other monsters. Granted, I am biased toward anything with the original set of ghouls, but I thoroughly enjoyed Eric’s artwork and Tim’s storyline, and I’m pretty sure you will too. Monster City looks like a keeper. 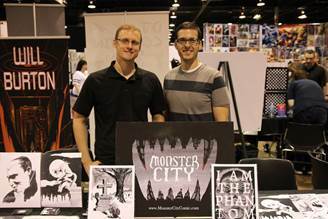 Go to www.monstercitycomic.com to download a free 14-page preview of Monster City #1: The Phantom. You can also purchase both digital and print copies. Ok, admittedly it was the hot, nerdy guys in glasses that originally made me drag Chris over to the booth, but once we got there, we discovered the most innovative use for comic books that we’ve ever seen. 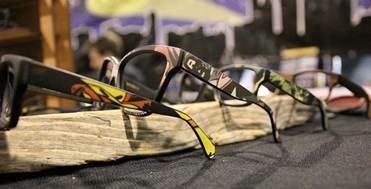 Sire’s Crown is a Los Angeles-based company committed to making the most durable wood-framed eyewear on the market. Yes, Sire’s Crown is serious about trees and is absolutely not cutting any down to make their product. In fact, they have a company goal to plant 100,000 trees in the next twelve months. Instead of their beloved trees, all their eyewear is made from a durable cotton fiber and wood pulp composite. However Sire’s Crown is also serious about recycling paper and has done just that to create frames out of old comic books. Every frame is a one-of-a-kind and range from subtle, non-descript colors blended into the design, to showing actual identifiable comics on the stems. Sire’s Crown can fill your prescription or set you up with a very unique pair of sunglasses. Celebrities like Bill Murray and John Malkovitch are fans and you can roll with a pair of Iron Man sunglasses for around $400 – a small price to pay to rock an exclusive pair of shades like that. In his thirteenth year of business, Jeffrey Stelter’s company Stelter Creative is a scenic artistry shop specializing in over thirty-five fabrication mediums for prop-making and set-building. They even do handcrafted suits of armor which you can see in Universal Studio’s Diagon Alley. We hear you loud and clear Jeffrey – the Vampire Hunter’s Kit is already on the Christmas wish list along with the Book of the Dead from The Mummy. 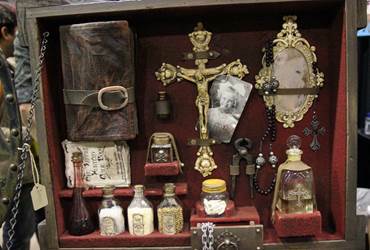 Check out Jeffrey’s amazing creations and prop replicas at the Stelter Creative web site. Chad knows how to get a girl’s attention in a show floor packed with booths. 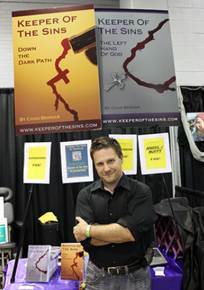 Just put up a sign that calls out for fans of Constantine to check out Chad’s new series, Keeper of the Sins. And so, of course, I did. Keeper of the Sins revolves around the concept that there are artifacts in the world which are tainted or cursed. Some items have the ability to corrupt individuals with power or wealth. Other artifacts, when in the wrong hands, can cause horrors to innocents at large. Traditionally, a monk, hermit or other holy man would guard them from the rest of the world and although they are chosen for their resolve and determination, the holy man is after all… just a man. Each “Keeper” is ultimately destroyed as they fall to the temptations the artifacts offer up. Keeper of the Sins falls right in the Goth Chick zone so we’ll be delving further into Chad’s world in an upcoming interview. But for now, head over to Amazon and check out book one in the Keeper of Sins series, The Left Hand of God, very recently joined by book two, Down the Dark Path.